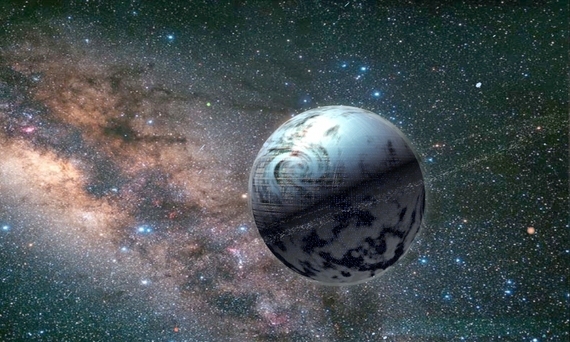 Gen'Rai - meaning 'Beginning of Life' in the Brarantian language - is a planet located in the heart of the Deep Core, surrounded by maw clusters and stars that have been pulled in by the clusters' powerful gravity. Because it is located within the maw clusters, there is no way for the planet to sit in a standard orbit. The planet holds its current position year round based on the gravity of the maws surrounding it, thus the arbitrarily assigned year passing every 100 days. The planet itself has powerful gravity, which further allows it to maintain its position. The pull from all of the different maw clusters around give the planet its spin, which is faster than many planets resulting in the lowered oxygen and higher gravity. The planet has nineteen separate stars (or suns) that give it light, and due to this fact there is no night cycle on the planet. This accounts for the sub-prime surface terrain. Under the planet's thick outer core are flowing networks of water and cavernous expanses where ample food is able to grow. The Brarantians, the native species to the planet, developed underground in the large cavernous expanses that housed plant life as well as that of the planet's indigenous non-sentient species. Throughout their cultural history, they have been a religiously organized society. This religious organization has kept the planet viable, as it is considered sacrilege to destroy any part of the underground caverns. Thus, the homes and processing plants are built on surface, so as to avoid damaging any of the valuable eco-structure of the planet. The planet started with one small area of settlement, and expanded outward from there - constantly building on to the city until virtually the entire planet was eventually covered in one, massive city - similar to Coruscant. Due to the fact that all of their food supplies come from below the planet's surface, the city-planet's manufacturers' and processing plants' pollution is of little to no concern to the ecosystem. However, pollution is kept to a minimum so that the sparse oxygen does not deteriorate farther. Due to over-exposure to the sun, the Brarantians spend most of their time inside their massive buildings. Due to its location in the Deep Core, Gen'Rai has never been visited by any alien species, and as such they believe themselves to be the only inhabitants of the universe.